Summer is Mango Season, yes, the season of king of fruit in India..I think in India nobody eats any other fruit than Mango in Summer. With a vibrant yellow color, rich creamy pulp and unbeatable taste, mangoes hold a special place in my heart and home. Even though we get Mangoes here in Singapore all year long, but the taste is not even near to our Indian Mangoes..miss them a lot. So, to satisfy my mango cravings, I make something with canned mango puree. The thing with the canned mango puree is that, you have to use the whole can at once, can't let it sit even in the fridge, then it tends to go bad very quickly. So, I made two desserts from a can same day and used the whole can. I made Mango Burfi and Mango ice-cream using only two ingredients, one can of mango pulp and two small cans of condensed milk and a perfect ice cream without an ice-cream maker. 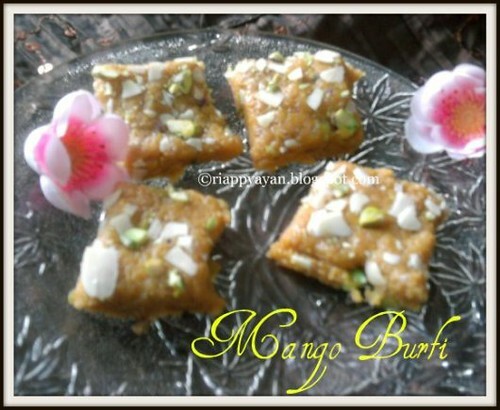 A Burfi is generally made with milk, cottage cheese and sugar. Some are made of a combination of dried fruits and sugar. Dairy based Barfis may have dried fruits, nuts, and fresh fruits added them during the cooking process. The Barfis that have a dairy base have a smaller shelf life that the ones made with just dried fruits and nuts. Barfi is often flavored with fruit (such as mango or coconut), vegetable (such as carrot or beet), nuts (like Cashew and pistachio) and spices such as Cardamom. Ghee(clarified butter) : 2 tblsp. Heat ghee in a heavy bottomed pan. Add coconut and roast on a gentle heat until the colour of the coconut just begins to turn golden. Pour in the condensed milk and mango pulp. Blend well and bring to simmer. Stir occasionally so that the mixture does not stick to the bottom of the pan. The mix will begin to thicken slowly. Continue cooking and stirring till you see the mix thickened. Add chopped pistachio, leaving little for decoration. When it's done, you'll see the mix will come together like a dough and teh ghee will seperate from the mix. Remove from heat and sprinkle cardamom powder over it. Mix well. Grease a big plate with little ghee. Spread the mix evenly on the plate to 1/2" thickness. Cool and cut into squares or diamonds. Refrigerated, this burfi will be good for almost 2 weeks. Keep in an airtight container and enjoy anytime of the day whenever you crave for something sweet. 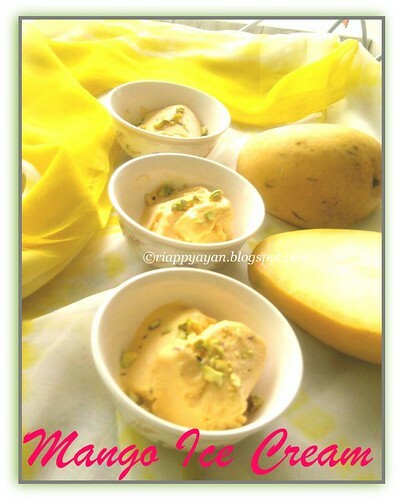 I was so craving for Mango Ice-cream that day, I wanted to make it asap, but didn't have heavy cream in my hand which is a must for making a smooth ice-cream, so I looked for a ice-cream recipe with condensed milk and I found it in Mansi's blog. Thanks, Mansi for this wonderful recipe and I could satisfy my cravings the same day.You don't need an ice-cream maker to enjoy a bowl of your own handmade ice-cream. 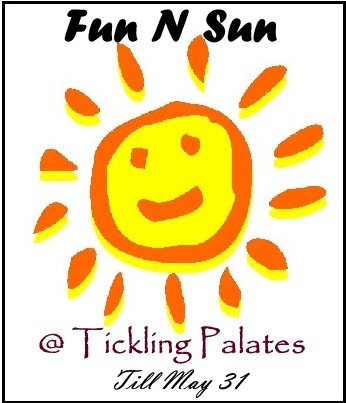 Try this process, with a little hassle in no time, you can serve your family hand made guilt-less flavourful ice-cream. Boil the milk till it becomes almost half the amount and creamy, about 10-12 mins, then remove from flame and add condensed milk to it. Allow the milk to cool to room temperature. Once the milk is cool, add the mango pulp to it and blend well. Check for taste and add more sugar, if you like. Transfer the ice cream mixture into a wide bowl, then chill in the fridge for up to 2 hours, checking on it after 1 hour. The reason it can take longer than an hour is when a recipe mixture has had cooked ingredients added, therefore thorough chilling will take longer. Take the bowl out of the fridge and transfer to the freezer for about half an hour. Then check just how much the mixture has frozen - ideally, it should have started to freeze at the edges but not fully through to the centre. Take the bowl out of the freezer and transfer the mixture in a blender/mixer. Add the cardamom powder, chopped pistachio and vanilla essence, blend well until the mixture is creamy once again (to dislodge and break up the ice crystals that have formed). Put the mixture back in the freezer for another half an hour, then remove and once again beat in the mixer. Do this again so that you have beaten the mixture a total of 3 times whilst freezing in between. Put the mixture back into the freezer for a final time until it’s ready to eat. This can take anything from 30 minutes upwards, depending upon the quantity and type of ice cream you’re making and also how you like the consistency of your ice cream. 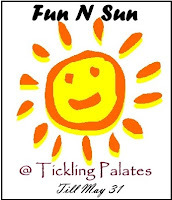 thanx for putting the write-up. Indeed, now we seem to rely more on Coke etc for beating the summer heat. Lets go for Frruits-Naturally Yum!! Fabulous mango burfi and icecream, both looks super tempting and delicious..
Slurp,mouthwatering finger-licking burfi and icecream..delicious! Wow, they look superb dear !!!! ahaa! The burfi and icecream look outstandingly yummy! 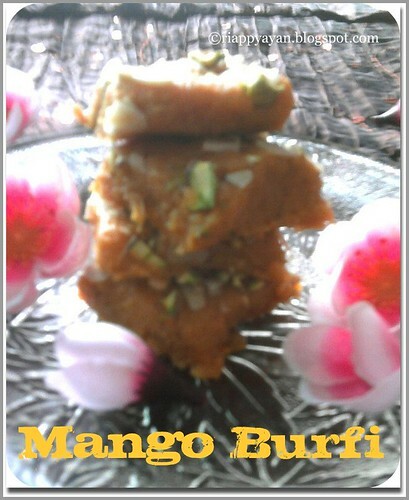 Burfi looks yummy and so does the mango ice- cream below,your blog deserves the name recipe junction. 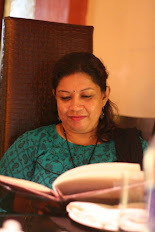 Wonderful mango recipes.. looks absolutely perfect and tempting.. Beautiful blog !! 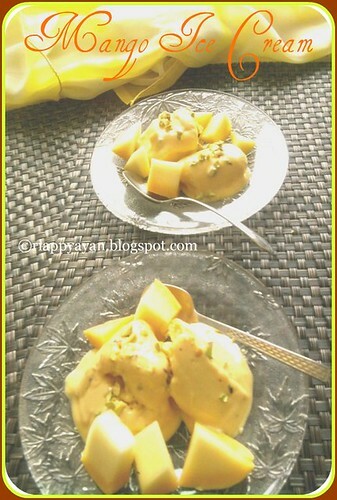 Yummy burfi and mango ice cream.